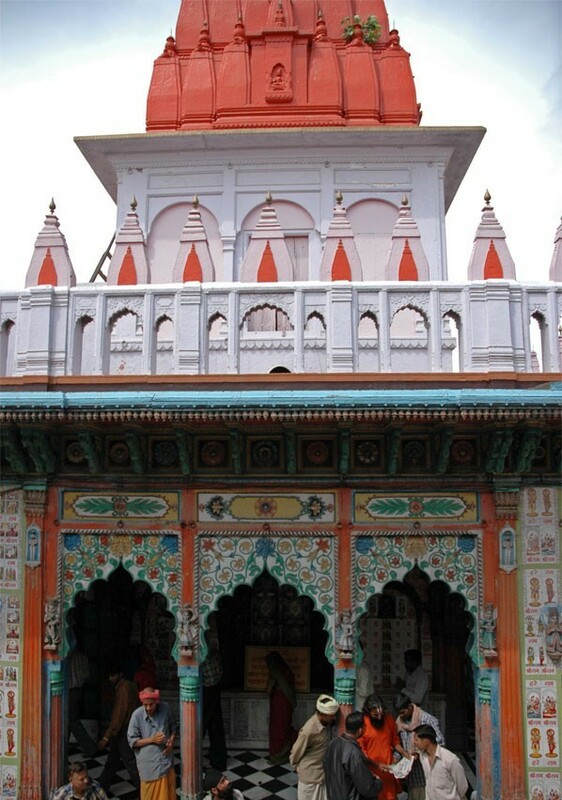 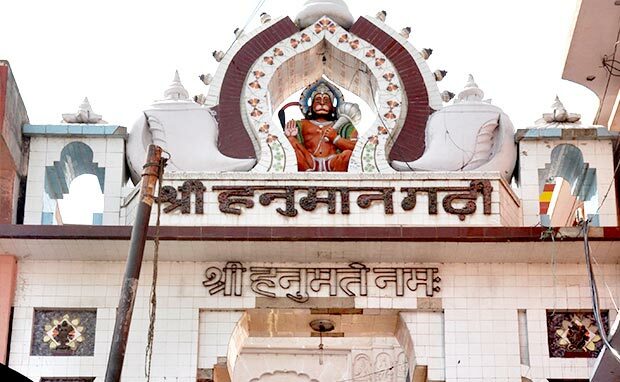 Hanuman Garhi is the most popular shrine in Ayodhya. This place is associated to Lord "RAMA" and their attributes.This is a very crowded Hanuman Temple with numerous murtis of gods and goddesses.Here is Some Information about Hanuman Garhi in Ram Janma Bhumi Ayodhya Uttar Pradesh. 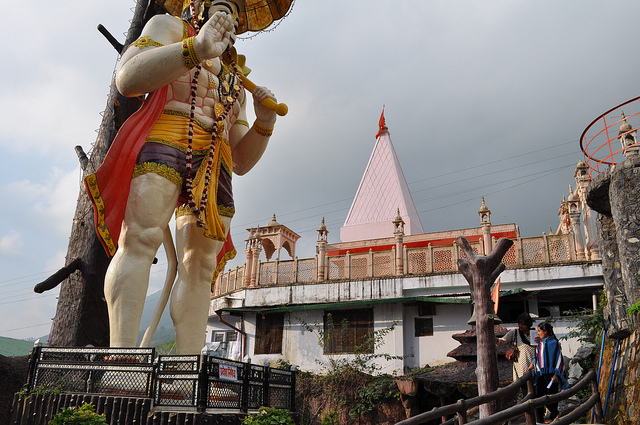 Hanuman Garhi is one of the most famous temples of Lord Hanuman in North India. Hanuman Garhi is located in the center of the Lord Rama's Birth Place City of Ayodhya Uttar Pradesh.The Present temple was built in 10th century and built by Nawab of Awadh.The temple is dedicated to Lord Hanuman.To reach the temple, 76 steps need to be climbed. 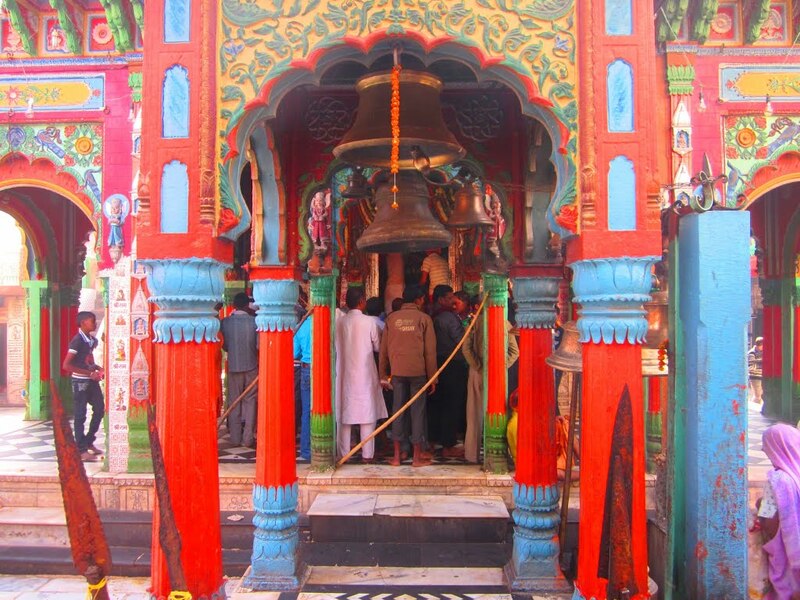 Land of the temple is believed to have been donated by Nawab of Avadh, on which construction was done during the middle of the 10th century by one of the courtesans of the Nawab. 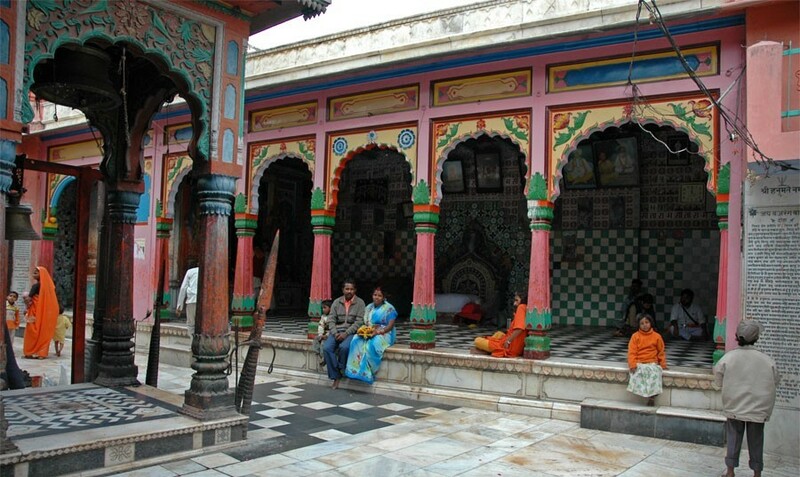 The temple has the form of a large four-sided fort-like structure with circular bastions at each corner. 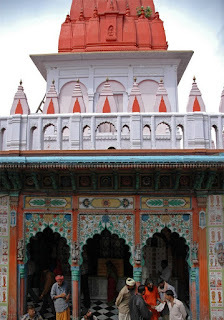 A massive structure in the shape of a four sided fort with circular bastions at each corner houses a temple of Hanuman and is the most popular shrine in Ayodhya.It is believed that the cave used to be the residence of Hanuman and guarded Ramkot. The temple has a shrine of Goddess Anjani with Hanuman in her lap.At the first look of the deity, one may not be able to see clearly the details of Mata Anjani and Sri Hanuman. Locals believe that the deity answers all the prayers. 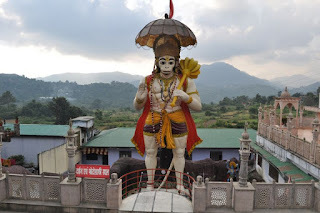 Every day thousands of devotees visit Hanumangarhi to offer prayers and seek Lord Hanuman’s protection from evils and blessings for happiness and prosperity. There are Hanuman Jayanti Festival, Ram Navmi, Dussehra and Choti Diwali grand celebration in Hanuman Garhi in Ayodhya.Large numbers of the people take part this celebrations. 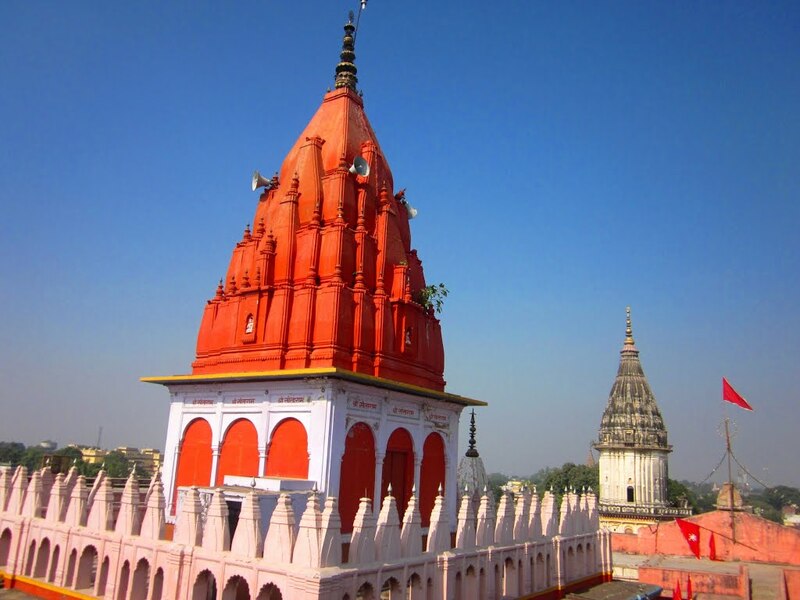 By Air: The Nearest Airport is Lucknow Airport(135 Km) and Varanasi Airport(200 Km). By Rail: Ayodhya has its own Railway station and easily to reach Lucknow and Varanasi Railway station. 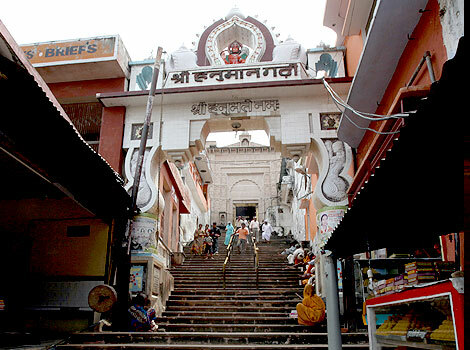 By Road: There are many public and private vehicles available to reach hanuman Garhi Temple in Ayodhya.